Stock photo, not actual care facility. 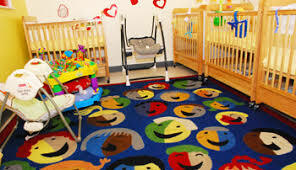 Our Infant Room serves children 6 weeks to 18 months old. The room is arranged to safely allow a wide range of activities which stimulate healthy growth and development—through hands-on experiences with people, objects, events and ideas. Each day’s experiences are carefully chosen using Creative Curriculum. This early childhood development program allows our staff to provide uniquely nurturing care that encourages each child’s enjoyment of their earliest learning experiences—discovering the world through exploration and play. All care providers/teachers meet or exceed state licensing requirements. Many of our staff hold an associates or bachelors degree in Early Childhood Education and some are currently attending area colleges and universities in the field of education. All staff are trained in CPR and First Aid, and participate in ongoing professional development training experiences year-round. DUE TO MANDATORY STATE OF MICHIGAN WAGE INCREASES, EFFECTIVE JANUARY 1, 2019, TUITION WILL INCREASE TO THE FOLLOWING RATES. WE CONTINUE TO REVIEW AND ADJUST OUR PROGRAM COSTS. DURING 2019, THE LEARNING CENTER WILL CONTINUE TO EXPLORE ADDITIONAL RESOURCES, i.e., FUNDRAISERS, SAVINGS INITIATIVES AND PROGRAM CHANGES.